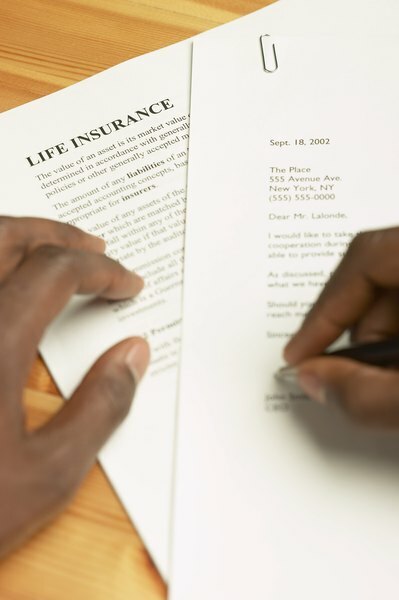 First-to-die life insurance allows both spouses to purchase coverage under the same policy. 1. What Types of Changes in My Life Can Affect My Life Insurance? 2. Can I Be on My Retired Spouse's Insurance? 3. What Is a Single Life Annuity? If you are married and have dependent children, both you and your spouse should have enough life insurance to cover your household expenses in the event one of you dies. A first-to-die policy, also known as a joint life insurance policy, may be able to give you the coverage you need while saving you money on the monthly premiums. The policy will pay out its entire death benefit as soon as the first spouse dies, guaranteeing that your children will be adequately protected. First-to-die policies combine life insurance for you and your spouse into one joint policy. Both individuals are listed as insured parties on the policy. When the first person dies, the policy's death benefits will be paid out to the survivor. The policy also terminates at that point, leaving the surviving spouse with no life insurance coverage. Joint life insurance policies also remove the uncertainty involved in predicting which spouse will die first. You may not be able to afford significant coverage on both of you, so you would have to predict which spouse needs the highest death benefit. This can be a problem if you guess wrong and the spouse with the lower coverage amount dies first. An insurance policy also tends to pay out faster than waiting for the decedent's estate to settle. The surviving spouse can use the policy's death benefit to pay household bills while waiting for the estate proceeds. You will only have one premium to pay each month instead of two with first-to-die life insurance. Payment processing fees and other charges are also combined into a single policy instead of doubling up for you and your spouse. First-to-die life insurance eliminates wasted premiums if your family only needs one death benefit. Make sure first-to-die life insurance is right for your family's situation before purchasing a policy. A joint policy may be more expensive than buying two individual policies in certain circumstances. This typically happens when one of the spouses is harder to insure than the other because of differences in age or medical history. You will also only get one death benefit, which may not be enough to continue your family's current lifestyle. If you have disabled children, the surviving spouse may also need a life insurance policy to make sure the children have continued long-term care after both of you are gone. It may be more difficult for an older spouse to obtain a new policy after the first-to-die policy terminates. Is Mortgage Insurance Better Than Life Insurance to Pay Off a Mortgage Upon Death?